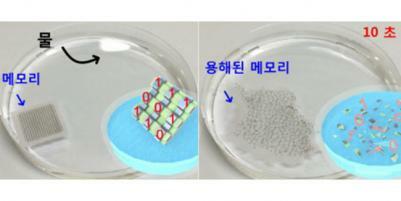 Researchers from the Korea Advanced Institute of Science and Technology (KAIST) developed a security RRAM device that can be dissolved in water in less than 10 seconds. The idea, it seems, is that this kind of device can be disposed of quickly and safely. The RRAM device was produced on a solid sodium glycerine (SSG) substrate, which is water soluble. The RRAM chip itself was deposited using an inkjet-printer. The researchers say that a cost of such a device is about 10% of a similar device deposited on a silicon substrate. Of course the device itself is much less durable, but in some use cases this is a plus.